Held in 2001, the ‘Blue Moon’ festival grew out of an idea by Toyo Ito to erect housing at five ‘hidden’ locations in the city core. Ito himself designed a mute gallery space and two apartments (Uurwerkersgang 10). The project by the Oslo-based Space Group consists of a house, a child day care centre and a swimming pool; the facade cladding includes stretched tent canvas (Achter de Barakken). 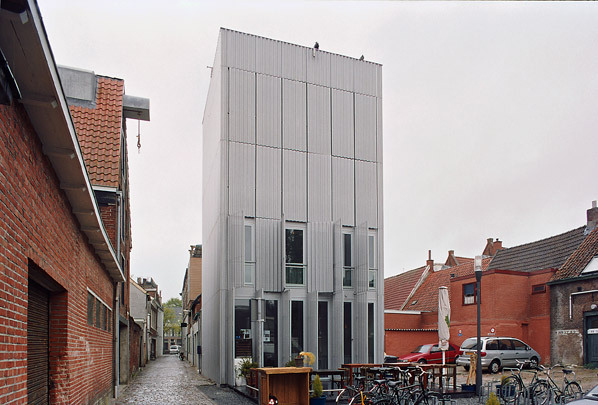 Tony Fretton designed an apartment complex with two dwellings on a minimal location (Lutkenieuwstraat 3). Foreign Office Architects designed a tall narrow block clad with panels of corrugated sheet that can be opened (Schuitendiep n.z. 88/5). The project of the fifth architect Xaveer De Geyter’s was temporary.